When wood dies, it has a short period of time to prepare itself for petrification. If wood can manage to quickly be covered by fine sedimentary stone after its death, it will become petrified wood. Petrification allows for the preservation of the wood’s original form. When wood becomes petrified, it will even preserve the most minute details such as wormholes, fungi and growth rings. This preservation allows for a spectacular specimen once the process is complete. Petrified wood is commonly referred to as fossilized or agatized wood and has been identified as a member of the Quartz family. Most people believe that the wood actually turns itself to stone but this is a common misconception. The wood appears as if it has remained, but this is only the outer physical form of the wood. After petrification is complete all of the wood is replaced by silicon dioxide, and this is the reason we see Petrified Wood a part of the Quartz family. Petrified wood allows us to tap into our patience, it represents our journey of spiritual growth at a steady and consistent pace. Petrified Wood takes a long time to complete the process of petrification and this long journey’s patience is emulating from its contents. Petrified Wood will allow one to become more trusting in the process of life and in the journey of evolution. When we are feeling that “bad” things keep occurring, Petrified Wood will allow us to have trust in the obstacles thrown in our path. These obstacles are here to be tackled and remind us that they are eventually contributing to our highest good. When we are holding or wearing Petrified Wood, we are allowing and trusting the timing of the Divine, and are noticing the signs along the way. Those struggling with spinal or skeletal injuries will benefit greatly with this stone as it stimulates steady growth and the progression of physical healing. Petrified Wood helps one to support all types of physical healing and will help to heal the liver and gallbladder. It also helps to cleanse and detoxify the liver and helps to regenerate proper blood cells in the bone marrow. Wood in general is a very strong material and is connected to the makeup of our own skeletal system. Placing a piece of Petrified Wood over the affected area of injury daily will allow for the consistent repair of the skeletal system. Those undergoing change and transformation can ease the process of chaos by wearing Petrified Wood around the neck. 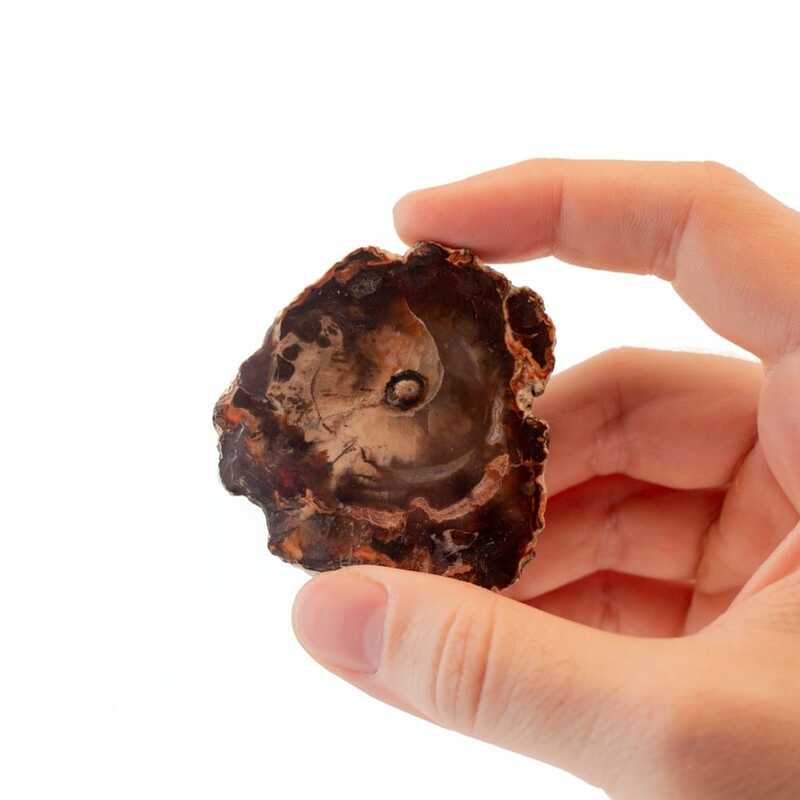 When inevitable change strikes, Petrified Wood shares with us visions of itself 200 million years ago and reminds us that we are apart of the Great Wheel of Life, and that it is okay to surrender to change no matter how painful it may seem. These ancient trees have withstood and experienced the earliest days of our planet, and were petrified to be shared with us, the “future” of Planet Earth. Some of the most famed specimens of Petrified Wood age back to 200 million years ago. One of the most popular and historical specimens can be found in Holbrook Arizona where trunks over 200 feet long have been petrified. This sight is so great that it is now referred to as the “Petrified Forest”. Because Petrified Wood is so old, it has no problem assisting one in Past Life Recall. If one has endured struggles from the past or past lives that have led to insight and evolution, Petrified Wood will assist in remembering these insights. Petrified Wood helps us to put past struggles into new strengths just as it has grown from wood to asolidified, immortal stone. Petrified Wood has literally withstood the test of time, and because of this, it has the powerful ability to teach us about Earth’s true history. It reminds us of a time where all races walked the Earth in equality, seeking knowledge from one another and from nature’s kingdoms. These specimens contain memories from one to two hundred million years ago and can be utilized to tap into Earth’s Akashic Record files. When paired with stones like Serpentine or Aqua Lemuria, one can learn about ancient civilizations and the original seeding of our planet that led to our evolution. With enough time, effort, and meditation, one can even speak with those who were apart of these civilizations for greater accuracy and insight. Some great pairings for Petrified Wood include Bloodstone (for increased physical strength) or any member of the Quartz family (Especially jaspers and agates). If one would like to gain assistance in past life recall try pairing Petrified Wood with Alexandrite. Petrified Wood helps one to rid themselves of any negative genetic programming or paradigms that limit ones consciousness. These limiting emotional patterns and behaviors were passed down to us through survival instincts and are no longer necessary for our survival. Petrified Wood knows this, and will assist one in rebuilding expansive belief systems that encourage us to absorb ancient wisdom and come back into balance.